Listen to the interview. Background ambiance courtesy of Trident customers and staff. I mean, what a thing to say in a big crowded room like that. And it put sort of … in a flash, I realized that I was holding myself somehow separate from the whole thing … and that I was having this kind of habitual reaction that was completely useless and that I could just cut my hair, buy a sport jacket, put on a tie and go serve at Kalapa Court. And that’s what I did. I just like made a bee-line for it. PK: I did a lot of service there, and he was very playful and scary and all those things … and my relationship to him always was as a servant. I was never one of these people he started businesses with or appointed this or that or … In fact he almost … despite my various efforts to get him to give me advice or tell me what to do, you know, he almost never would tell me what to do. About the only time he did was in ’83, when I asked him about the three year retreat, and he suddenly became very interested and he asked me about what my interest/intention was. And at that time there was no three-year retreat in Vajradhatu. In fact there wasn’t even an Abbey. And I was talking about a three-year retreat with other teachers because it seemed like the most intense thing I could do and I’m always trying to do the most intense thing I can, because I figure life’s short. WF: What was the situation where you asked him? At the court? PK: No, it was at the ’83 Vajrayogini ATS at Rocky Mountain Dharma Center, or whatever it’s called. PK: Let’s just make sure we rename it every year. It was at a very kind of strange and sort of magical … He was working magic at that ATS …particularly in terms of things around the weather and stuff like that. PK: Yeah, August of ’83 … and just to complete the thought … he said, “We’re translating the liturgies. Wait until the liturgies are translated. Then it will be ours. Then it will be our retreat.” That was his phrase: “Then it will be ours. Then do it.” So, I took that as instruction. It was probably the only really clear thing he ever told me to do. There were like one or two other times when he actually said something to me on the level of instruction like how to work with my mind, but mostly he kind of let me, you know … And he’d ask, what I was doing and I’d tell him and I’d ask him questions and he’d say, “Sounds fine.” or, “You’re very organized.” or things like that. WF: This would happen in serving situations … sometimes? PK: When I would ask him. PK: Yeah, sometimes. Mostly I felt like… I always felt … it was part shyness and part that I should respect the role … that I didn’t want to intrude. And the feeling was that, as his servant, I should always be as invisible as possible, and not inject myself into the situations. So I always tried to do that. I think he sensed that that’s what I was doing. Once in a while he’d kind of like draw me out. But often when I served him it was with … there were a lot of other people around. It just wasn’t appropriate to do or say much. And that relationship continued like that for ten years. Yeah, I knew him for ten years. WF: So you went to the 1980 seminary? PK: I went to the ’82 seminary, moved to Karme Chöling and did Ngöndro like I was shot out of a cannon. I made it to ’83 Abhisheka, and managed to make it to Chakrasamvara abhisheka in ’86. WF: Wow, you’re really a practitioner. PK: Well, I guess … yeah. [Laughs.] It’s my connection, and that’s it. So I’ve made a lot of decisions and a lot of sacrifices on the sort of worldly front in terms of making money, owning a home, and having a marriage and that kind of thing … to go do the most intensive practice situations I could find. That’s what I did. I’m still doing it. Sometimes I wonder why. You gotta ask yourself; nothing’s a given. I mean you’re not … even if you’re doing what seems like the right thing, it may not be the right thing. And it’s so hard to know sometimes. WF: Can you say anything about the connection between being a servant and being a yogi? Is there a connection between those two things? PK: That’s an interesting question. [Pause.] Well, what comes to mind … two things come to mind. One is the idea of being a … having the Shambhala transmissions as a way of containing one’s practice in this particular world. And by being a servant at Kalapa Court … I mean I learned so much. I had no idea that I was learning much of anything, you know, much of the time, beyond how to place a fork, you know, how to do … what’s the difference between French and English service. And then there’s Russian service, which I can’t even remember. But when you were at the Court, you were actually participating in his mind, you know … you’re in the kitchen polishing something and he’s in the other room, you know, dealing with, working with a group of people in some way … it was still his mind. And at some point I started to connect with that. I mean this was outside of my frame of reference, this is not something … this is not an easy … notion to get. And I’m not sure it’s exactly anything anybody ever told me. But, it was true. So … some kind of attitude of respect or precision. [Interrupting.] Are we in your way? Do you need to get back here? I can move if you want. Okay. Precision and respect and gentleness in one’s life actually contains the blessing of one’s practice and the practice is very, very hard fought. I mean you have to really … the yogi has to really practice hard. And then there’s the sense of carrying it forward, like with the conduct, containing it, not leaking. And that’s the beauty of the Shambhala teachings in this culture. Because this culture is sort of all about leaking; it’s sort of all about degradation; it’s all about setting sun. And his genius was seeing how to actually transform that very material into a way of containing wisdom and carrying it forward and developing it. You don’t really develop wisdom, but you develop the understanding of it and that’s the path. I’m … you know … I’m so grateful. WF: That’s very well said Phil, very well said. PK: Yeah, not very many people are lucky enough to meet somebody like him. © 2003 by Phil Karl. 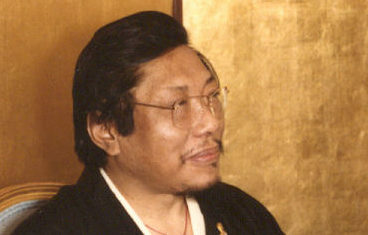 Phil Karl became a student of Chögyam Trungpa Rinpoche in 1977 and earned a Master of Arts degree in Buddhist and Western Psychology from Naropa Institute in 1979. 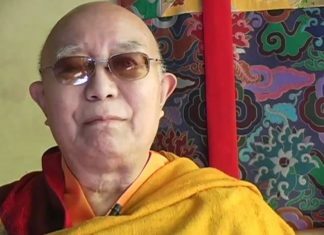 He has taught at the Boulder Shambhala Center, the Shambhala International Seminary, and is a core faculty member of the Ngedon School. On the first of September 2003 (twenty years after discussing it with the Vidyadhara), Phil will complete the three-year retreat at Sopa Chöling, Gampo Abbey.